Cormorants are one of my favourite birds – I love their craggy profile and their habit of standing rather awkwardly with their wings out, soaking up any winter sun that’s available. 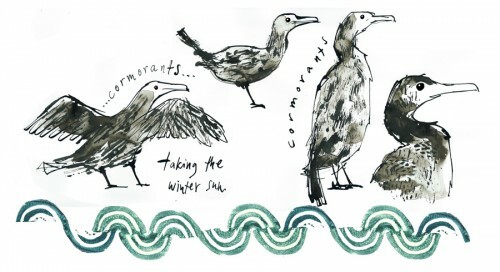 I was always very fond of Graculus in the Noggin the Nog stories – it’s never entirely clear what species he is, but he must be closely related to the cormorant family. There are so many of these magnificent creatures on the Thames these days, particularly in winter, and there’s a particular tree on Stephens’ Eyot just downstream of Kingston that always has quite a group of them perched in its branches. I watched some diving near Chiswick the other day – they whirl round like a Catherine wheel on a pivot before they disappear underwater, often for quite a long time. Dawdling on the towpath is all part of the preparation I’m doing for the exhibition I’ll be holding at The Art Cabin this May – it’s inspired by the river Thames, and I’ll be posting lots more about this as things develop. I’m looking forward to experimenting with collage and paint, and also to learning how to make woodcuts at the London Print Studio. This entry was posted in birds, Exhibitions, Illustration, River projects on January 15, 2014 by Jane Porter.